The Sea Witch has abandoned her duties at the bottom of the sea to lead a dissolute life on land. All goes well until the devil visits her luxury suite to remind her she's not getting any younger. He won't take her immortal soul and save her from an eternity of suffering if she doesn't find an apprentice before she dies. The Sea Witch can't allow that to happen; she's committed far too many spiritual crimes. However, the world has changed in the last one-hundred-forty years. No one even believes creatures like her exist. A young mer prince lives a solitary life exiled from the sea. He serves the Sea Witch as payment for saving the mer kingdom long ago. Now she promises to release him from his debt if he'll help her find an apprentice. He crafts an employment ad to lure the perfect candidate. Miriam is an unusual young woman. An orphan raised in the confines of a convent, she yearns to contribute something of spiritual value to the world. She comes across an employment ad for a caretaker in a local paper and feels compelled to respond. When she arrives for her interview, the mer prince does his best to dissuade her from taking the position, but suspicious of his motives, she refuses to heed his warnings. By the time she realizes her stubbornness has cost her a love she never imagined could be hers, it's too late. Miriam's faith in herself unravels as her choices take her farther and farther out to sea. 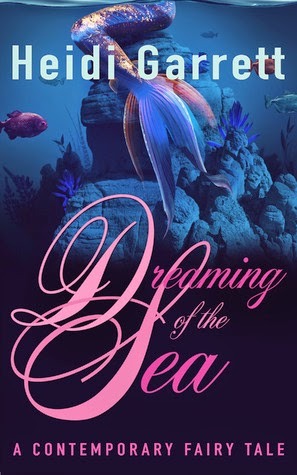 Dreaming of the Sea is a retelling of Han's Christian Andersen's "The Little Mermaid." Dreaming of the Sea is a modern fairy tale set in two worlds: under the sea and our world on land. The first half of the book tells the story of Gia, the sea witch. Sold to the prior sea witch, Gia grows up under the sea as the sea witch's apprentice. When the old sea witch dies, Gia takes over her position. I felt sympathy at times for Gia. She was sold as an infant, so the only life she ever knew was as a sea witch. Her only choice was to sell her soul to the devil or suffer for all of her misdeeds for all eternity. It's interesting to see things from the villain's perspective. Gia was not a good person, but she grew up only knowing bad. While I liked the first half of the story, there were times when it dragged a bit. That all changed halfway through when we are introduced to Miriam. Miriam had an awful childhood, horribly tragic and sad. But somehow Miriam finds solace through her faith and doing what she feels is right. I loved Miriam, loved the second half of the story. My heart broke when Miriam had to follow Gia under the sea to become her apprentice. But Miriam made the best of a rotten situation. She didn't let the evil cloud her heart or judgement. The ending is wonderful, and I cried happy tears. If you like fairy tales, you should definitely add Dreaming of the Sea to your TBR list. Heidi Garrett is the author of the contemporary fairy tale novella collection, Once Upon a Time Today. In these stand-alone retellings of popular and obscure fairy tales, adult characters navigate the deep woods of the modern landscape to find their Happily Ever Afters. She's also the author of the Daughter of Light series, a fantasy about a young half-faerie, half-mortal searching for her place in the Whole. Heidi's latest project is a collaboration with B. J. Limpin. They're cooking up a yummy paranormal romance! Signup for Heidi's newsletter at: http://eepurl.com/wWKUj for discounts on all new releases! Heidi was born in Texas, and in an attempt to reside in as many cities in that state as she could, made it to Houston, Lubbock, Austin, and El Paso. She now lives in Eastern Washington state with her husband, their two cats, her laptop, and her Kindle. Being from the South, she often contemplates the magic of snow. Miriam was one of those characters who was easy to love. Ooh this does sound interesting. I think I will add it to my to-read shelf.